You know it’s been a good year when it’s defined by, “the Bourbon smuggled to rooms by bellboys at the Seelbach in Louisville.” This is how F. Scott Fitzgerald remembered the year 1918 in a “short autobiography” published in The New Yorker in 1929. Each year was commemorated with a different beverage. This brief but telling anecdote covers a significant chapter in Fitzgerald’s life, a time that created memories powerful enough to inspire scenes and characters in his most celebrated novel, The Great Gatsby. With a new film based after it on the horizon, the book known as one of the best of the 20th century has received renewed attention. Louisville, Kentucky can take credit for serving as a critical muse. As can bourbon. When tension erupts between her husband Tom and Jay Gatsby, she offers to make Tom a mint julep. “Then you won’t seem so stupid to yourself…Look at the mint!” For Daisy, the julep may have been an evocation of the past, a taste of her youth in Louisville, and perhaps a salve for past wounds and heartbreak. For author F. Scott Fitzgerald, bourbon played a similar role, and was clearly a beverage he associated with Louisville. Stationed at Camp Taylor in Louisville, a training site for soldiers during World War I, Fitzgerald spent plenty of time getting to know the city and its haunts in 1918. He frequented the bar at the famed Seelbach Hotel in downtown Louisville, which hosted quite a scene. Larry Johnson, resident historian at the Seelbach, describes the city at the time as host to “a whole lot of illegal booze, and of course, gambling.” At the underground USO in the hotel known as the Rathskeller, Fitzgerald encountered a motley cast of characters and a good deal of mischief. He wasn’t above indulging in the hard stuff himself, and was even kicked out several times for drunkenness. 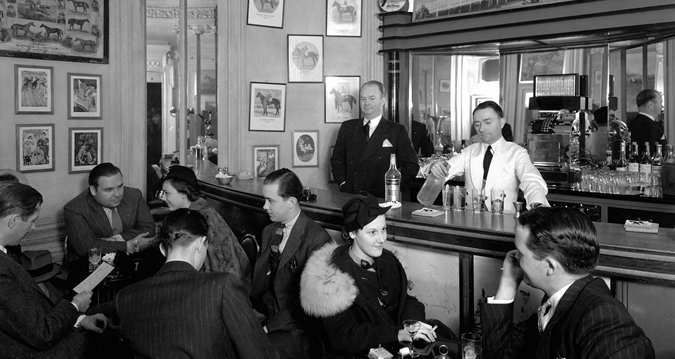 Fitzgerald also spent time at the Stables bar, which was so called due to the horsey vibe and the booths lining the walls. The area is now known as the Old Seelbach Bar. According to hotel lore, Fitzgerald began writing Gatsby on cocktail napkins from this establishment. Likely under his usual sustenance of bourbon and cigars, Fitzgerald described the character Tom Buchanan’s considerable wealth and depicted him “hir[ing] a whole floor” of the Seelbach for his wedding to Daisy. Various theories abound on the inspiration for Daisy. Dr. Johmann mentions Fitzgerald’s “first love, Ginevra King, whose father had taken Fitzgerald aside, supposedly, and told him in no uncertain terms, ‘Poor boys don’t marry rich girls.’” Fitzgerald also had a similar experience with Alabama belle Zelda Sayre, who shared many of Daisy’s qualities, and eventually became his wife. Or there may have been a young lady (or two) in Louisville. Ultimately, one wonders, what is it that so intoxicated Fitzgerald about Louisville? Was it the languid, Southern charm of the city? The Seelbach and the cigars? A debutante who embodied old money? Or was it that special ingredient in a mint julep? Likely, it was a heady mix of all that enchanted him. Slipping onto a stool at the Seelbach with a neat boubon today, one can imagine the raucous drinking, law-breaking gents, and rascally brawls the hotel has seen over the years. The rebellion and defiant spirit have soaked into the walls along with the liquor stains, and their essence remains. While Scott sat on just such a stool nearly a century ago, The Great Gatsby feels as fresh and relevant as ever. And the bourbon tastes even better. The post A Place to Have a Mint Julep appeared first on The Bourbon Review.